Like many of our clients, we are actively involved in closely held companies, which means we understand your position. And that we provide advice packages that would have been structured and implemented in exactly the same way if we were in the client’s situation. We also work hard to ensure that the advice we provide for our clients is future-proof. Advice is a partner for the long term. This was one of our fundamental concepts when we founded Advice in 1992 and now, after over 25 years as independent tax consultants, it is clear to us that this was the right approach: virtually all of our clients continue to consult us, year after year. 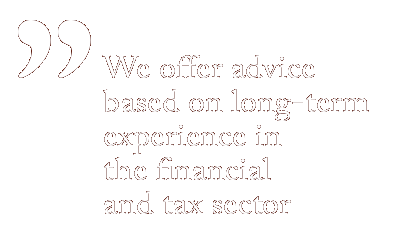 We want to be the adviser that our clients turn to for independent advice on tax – for tax planning and a tax strategy based on long-term experience in the financial and tax sector. 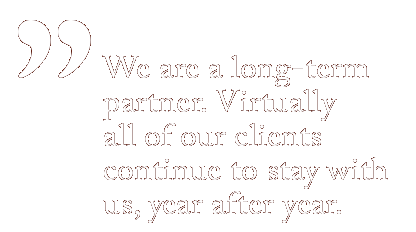 Our clients should be able to rely on us delivering on our promises. That is why providing clients with answers is a cornerstone of our business. 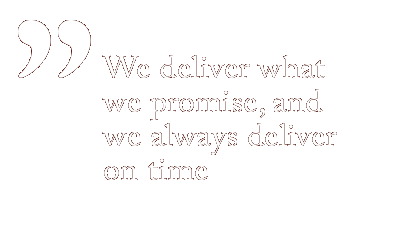 And why, for us, delivering on time is non-negotiable. We may deliver early, but we never deliver late. We aim to establish long-term relationships with our clients, and the fact that we have, in many cases, worked hand in hand with them over an extended period of time means that we are familiar with the client’s specific situation, even if they have not actively used our services for a while. Taxes and finance are an ever-changing and developing area. We work continuously to ensure we are up to date with innovations and changes in the field. As a result, we are able to actively assist our clients when it comes to benefiting any opportunities offered by innovations and changes in the field of taxation. The combination of up-to-date expertise and long-term relationships also ensures that we can tailor our advice to the client’s specific needs and situation. The implementation of a proposed solution is central to our approach and our philosophy. It doesn’t matter how good an idea is if no one takes charge of its implementation. Which is why we don’t simply suggest measures: we can help you implement them, too.